Pub in Notting Hill offering real ale and gastropub food. 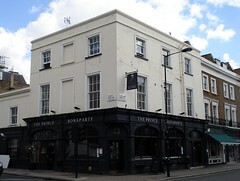 Previously owned by the Realpubs chain, it was acquired by Greene King in April 2011, along with the rest of the chain. Our comments below predate the takeover; however, signs are that Greene King intend to retain the Realpubs "concept". The public space of The Prince Bonaparte is a single room, at the centre of which is a large horseshoe-shaped bar surrounded by wooden chairs and tables plus some banquette seating along one wall and a dining area at the back. It's a bit gastro, with a hardwood floor, standard-lamp lampshades and chandeliers hanging from the ceiling, and everything in shades of brown and cream photo. The place feels quite spacious, although the ceiling is as low as a regular shop, and the lack of soft interior furnishings make Nick suspect that it could get very noisy when full, which seems typical for pubs in the area. The bar has four hand pumps, though on both our visits so far only one of them has been on, with one or two of the others either having just gone out of service or still being pulled through. On a Monday evening in December 2008, Nick had a pint of beer he fails to remember the name of, served in a jug glass and costing £3.20. On a Tuesday afternoon in April 2009, Kake wasn't in a beer mood, but did learn that Woodeford Wherry was currently on, and Doom Bar and Seafarers were coming next. The Time Out review linked below says they also have three different fruit beers on tap, plus Leffe, Hoegaarden, and Becks Vier, though we haven't confirmed this. Sitting at the front of the bar, one can see into the kitchen area. The menu is shown on a blackboard on the wall, but appears to be painted rather than chalked up, so Nick suspects that the A4 menu sheets mounted elsewhere with today's date at the bottom may be intended to create an illusion that the selection changes more rapidly than is actually the case. Food is served noon-3:30pm and 6pm-10:30pm Monday to Friday, noon-5pm and 6pm-10:30pm Saturday, and noon-9:30pm on Sunday. On Nick's December 2008 visit, the evening menu ranged from creamy soup for £4.50, through "Sausages and mash in a red onion marmalade" for £10.50 to sirloin steak at £17.50. On Kake's April 2009 visit, the lunch menu (served between noon and 3:30pm) looked quite interesting, with dishes including watercress, pear, and stilton soup (£4.50), fig and prosciutto salad with honey dressing (£7.50), grilled baby squid with pepper, tomato, and chilli salsa (£7), and beetroot and ricotta ravioli with sage and lime butter (£6.50/£8.50). Accessibility: A step up to get in at both entrances. Step-free to the bar, seating area, and toilets once you're in. Last visited by Kake, 7 April 2009. Food times taken from website, June 2009. Last edited 2013-05-10 07:48:24 (version 7; diff). List all versions. Page last edited 2013-05-10 07:48:24 (version 7).